NEW YORK, Feb. 6, 2019 /PRNewswire/ -- Arria NLG and Eagle Investment Systems, a BNY Mellon company, today announced a strategic alliance to enhance process automation using advanced natural language generation (NLG) technology. This alliance provides Eagle's clients with access to Arria's NLG capabilities which will connect directly to Eagle's product suite. The Arria platform can determine the critical facts and generate automated, real-time insights and narratives in plain, easy-to-understand language. This helps to inform faster decision-making, as users see insights they may otherwise have missed or misunderstood, and helps increase consistency in how results are interpreted and communicated across the organization. "We are excited to offer our clients access to Arria's NLG capabilities to help with the analysis of data stored within the Eagle platform," said Joel Kornblum, Eagle's Global Head of Strategic Alliances. 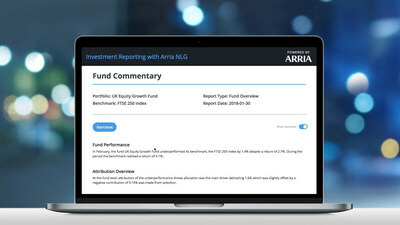 "We are working with Arria to build a set of capabilities in portfolio management, portfolio analysis and performance measurement that will help our clients potentially reduce the amount of time they spend writing personalized client summaries and reports." According to Jay DeWalt, ﻿Arria's Chief Operating Officer, "This technology is transformative, especially for financial services. Fund Commentary reports that typically take hours to produce can now be delivered in near real-time. Being part of Eagle's alliance program demonstrates the commercialization of NLG technology to assist clients and companies in efficiently drawing compelling insights and understanding from the wealth of data they possess. This leads to faster conclusions and better decision-making, as well as increasing automation for internal and external analysis and reporting." Every business collects data to help their company make better decisions. Arria's NLG technology transforms data into meaningful information which business stakeholders can easily understand and take action upon. The accuracy, unbiased delivery of information and speed that is only possible with the advancements in artificial intelligence and process automation is now available to businesses worldwide through Arria NLG. Arria NLG is the global leader in the field of Natural Language Generation (NLG), a form of artificial intelligence software, specialized in extracting insights from complex data sources and communicating that information in natural language (i.e. as if written by a human). Additional information available at www.arria.com.